We’ve had a few support tickets from people who are using the free version of SpendMap on Microsoft’s new Surface Pro Tablets, with the setting “Make text and other items larger or smaller” set pretty high (e.g. 150%). Settings like this can affect SpendMap’s minimum screen resolution test, resulting in an error message that you don’t have the required minimum 1024×768 screen size. If you get this error message, try adjusting that setting to 125% (or until you stop getting the message). TIP: The higher your screen resolution, the smaller SpendMap (and other software applications) will appear on your screen. Instead of adjusting your computer’s overall screen settings, you might also consider adjusting the “Font/screen scaling factor” in SpendMap, using setting #10 in Workstation Configuration Settings (PURCHASING > Setup system > Workstation configuration settings). 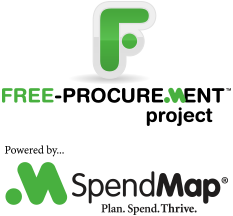 This will make SpendMap appear bigger on your screen, without affecting other apps on your PC.